MNA’s annual Volunteer & Donor Recognition Dinner was held on Friday, October 18 at the Kellogg Hotel & Conference Center in East Lansing. MNA members, trustees, donors and volunteers gathered together to enjoy an evening of camaraderie and a chance to appreciate the outstanding volunteers who have given their time and effort to help MNA with its mission. Old friends were reunited, new friends were introduced and many stories were shared as guests mingled before dinner was served and the presentations began. The successes of the Michigan Nature Association were touched upon and key donors were recognized. Richard Brewer and his wife, Kay T. Takahashi, were acknowledged for their generous land donation, MNA’s new Brewer Woods Nature Sanctuary. Several prestigious awards were given out to extraordinary volunteers. Charlie Eshbach, this year’s recipient of the Mason and Melvin Schafer Distinguished Service Award, shared stories of his multiple experiences in Keweenaw County, specifically with Estivant Pines Nature Sanctuary. Guests listened thoughtfully as Eshbach talked about his involvement with MNA over the past 40 years. MNA wants to thank everyone who attended the dinner for being a part of this special night! For additional photos from the Recognition Dinner, visit MNA’s Facebook page. Forty years ago, people across the state of Michigan rallied together to raise money to save Estivant Pines. In honor of the 40th anniversary of this event, anonymous donors have provided MNA with a new matching challenge grant. The donors will match all contributions over $500 to MNA, up to a maximum of $40,000 by the end of 2013. New membership dues will also be matched. You can make a secure donation at www.michigannature.org or by calling (866) 223-2231. 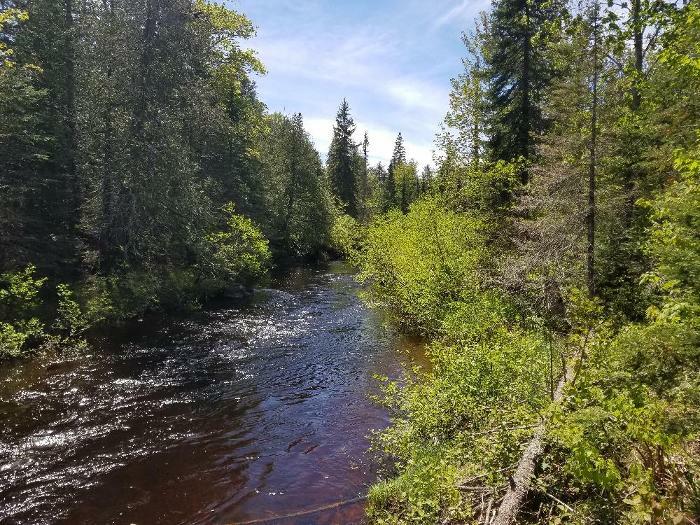 Estivant Pines Nature Sanctuary in the Keweenaw Peninsula has efficiently protected several threatened species and the beautiful white pines that cover the land over the past four decades. MNA and local citizens ended their three-year long battle on August 17, 1973 by successfully acquiring a copy of the deed to the Estivant Pines. 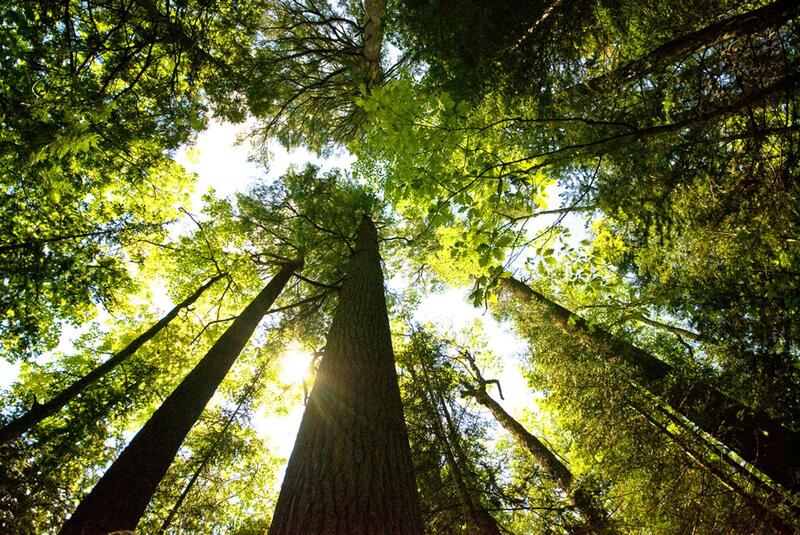 The “Save the Estivant Pines Committee” began in 1970 when local citizen Lauri Leskinen wrote a column that appeared in the Houghton Daily Mining Gazette that expressed the need to save the pines. Universal Oil Products, who had cut down about 350 acres of the old forest and had plans for future development, previously owned the Estivant Pines. 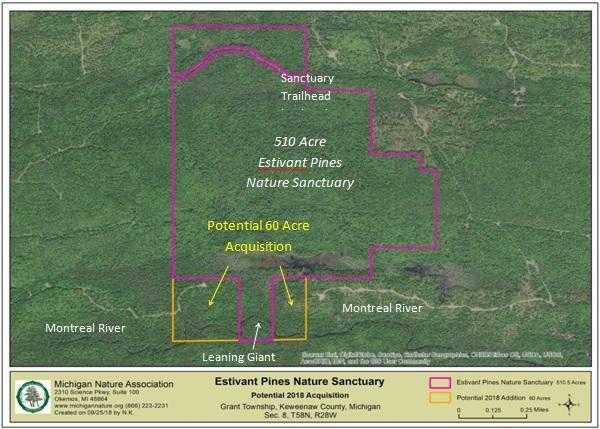 Charlie Eshbach and Jim Rooks were co-chairs of the committee that worked together with local citizens to generate enough funds to cover the $56,000 price tag that marked the foundation of Estivant Pines Nature Sanctuary. The sanctuary is often referred to as a “living museum” because of its large old-growth white pine forest, with some trees that are 500 years old and stand up to 125 feet tall. 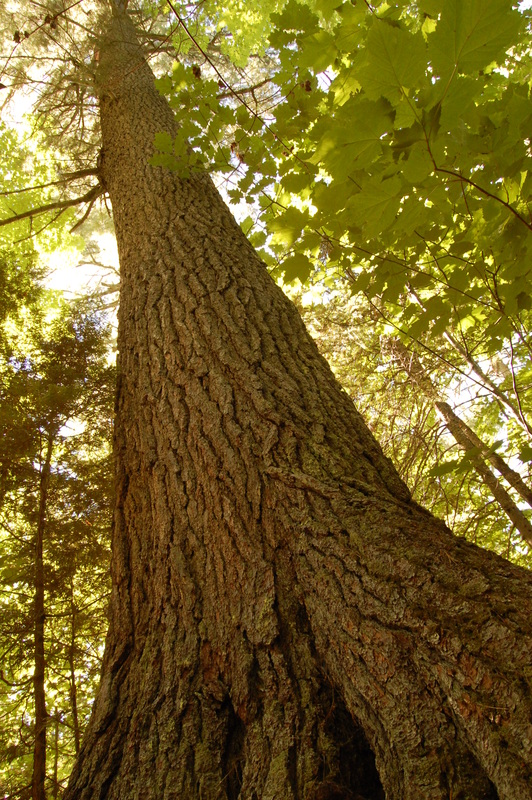 For the past four decades, Estivant Pines Nature Sanctuary has protected numerous species of plants and animals, including Michigan’s official state tree, the white pine. There are two trails that visitors can walk down, the Cathedral Loop Trail and the Bertha Daubendiek Memorial Grove Trail, to see the beautiful scenery of Estivant Pines. Visitors can also see several copper mine pits, dating back thousands of years. For more information, visit the Michigan Nature Association website or check out the Fall 2013 issue of Michigan Nature magazine. On July 21st, steward Hannah Rooks led an enthusiastic group of 28 hikers through the 508-acre Estivant Pines Nature Sanctuary that protects one of the last remaining stands of old growth forest in Michigan. As the daughter of well-known naturalist Jim Rooks, (the nearby James Dorion Rooks Memorial Sanctuary is named in memory of him), Hannah brought the added dimension of sanctuary history to this gathering. Along the trail, she shared some of the stories that her dad told her as she tagged along on outings. One recollection of a moment in the history of the sanctuary was particularly poignant and the group reacted accordingly. Hannah pointed out the very spot where her father had stood, with legal papers in hand, to block the encroaching lumbering operations that would have taken these grand old trees. We listened for birds, compared bilberries to huckleberries that grow side by side, and admired blooming orchids. On the Cathedral Grove loop, Hannah pointed out a prehistoric mining pit, dug some 4,000 years ago by indigenous people searching for copper. She led us down a side trail to an old mid-19th century mining camp where we viewed a few remaining relics. We continued on to the Bertha Daubendiek Memorial Grove Trail and stopped to pay homage to Bertha in the Memorial Grove. A little further on, picnic lunches were shared as we rested on smooth rock outcroppings, a favorite stopping point on the Memorial Grove loop. Along the trail, we had passed trees growing here for centuries…..towering white pines, red oaks, maples, birches, and hemlocks. No matter how often one visits this sanctuary, the old-growth giants never fail to inspire the fortunate visitor. If you’d like to experience the majestic pines for yourself, MNA’s 60th Anniversary Odyssey Tour visits Estivant Pines on Saturday, September 29 at 1 p.m. All are welcome to participate in a tour of the sanctuary and anniversary celebration. Visit the MNA website for details or to RSVP.